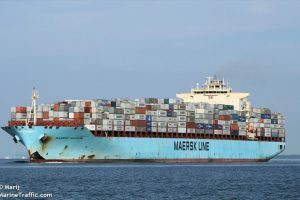 By Christian Wienberg and Alaric Nightingale (Bloomberg) — The world’s biggest container shipping line is trying to stop customers like Amazon.com Inc. and Alibaba Group Holding Ltd. from becoming competitors in just a few years’ time. Shares of FedEx Corp. and UPS Inc. dropped last week on a report that Amazon plans to handle more deliveries to its customers’ doorsteps. The question the maritime industry is now asking itself is to what extent the online retailer will also try to take greater control of transportation of shipments bound for Amazon warehouses. For now, those tend to be handled by Maersk and companies like it. Taking greater control of shipments would give Seattle-based Amazon more flexibility and help it avoid possible congestion in its warehouses. Skou is betting his strategy of combining the Maersk conglomerate’s container activities — including a shipping line, a port operator and a freight-forwarding service provider — will offer Amazon and others like it the integrated supply chain they need. The Copenhagen-based company has already come a long way. In 2014, it took more than 2 hours to complete a container booking at Maersk. In 2016, the average was 22 minutes, and management wants to bring that down to as little as 2 minutes this year. By creating more integrated, digitized shipping systems, companies like Maersk and Amazon could also speed up automation across supply chains, said Luis Benito, a Southampton, England-based innovation strategy director at Lloyd’s Register, which has been classifying the world’s merchant fleet since 1760. To begin with, that could mean optimizing delivery slots for vessels as they arrive at ports. Longer term, successful digitization may serve as a catalyst for multiple other aspects of automation in the maritime industry, he said. While Maersk is a giant in container shipping and in port operations, its freight-forwarding and supply management service unit Damco is relatively small and will need to grow to fulfill the conglomerate’s ambitions. The OCEAN Alliance, comprising ocean carriers CMA CGM, APL, COSCO, Evergreen Line and OOCL, will launch an enhanced service offering with 41 east-west loops starting in April 2018. 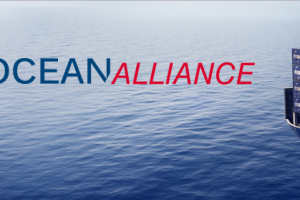 French carrier CMA CGM, a member of the OCEAN Alliance along with subsidiary line APL, COSCO, OOCL, and Evergreen Line, has announced the launch of the OCEAN Alliance Day Two Product, starting in April 2018. According to CMA CGM, the OCEAN Alliance Day Two Product will offer 41 enhanced services with an estimated carrying capacity of around 3.6 million TEUs spread across 340 containerships. The French carrier will deploy over one-third of these vessels, or 122 ships. The new product offering will feature 20 transpacific services, six Asia-Europe loops, four Asia-Mediterranean services, four transatlantic strings, five Asia-Middle East services and two Asia-Red Sea services. CMA CGM specified that on the transatlantic trade, the Victory Bridge service will be split to offer two specific services to the East Coast of the United States (Independence Bridge) and to the Gulf of Mexico and Mexico (Victory Bridge), but gave little else in the way of details pertaining to the port rotations and vessel size of the enhanced services. According to ocean carrier schedule and capacity database BlueWater Reporting, the OCEAN Alliance currently operates 39 services using 330 vessels with an aggregate capacity of 3.04 million TEUs. The nearly one-year-old east-west service network of THE Alliance, which comprises container carriers Hapag-Lloyd, Yang Ming, K-Line, MOL, and NYK, will include 33 revamped loops and one new Middle East loop, the AGX2. The service network of THE Alliance, which originally launched in April 2017, is expected to cover more than 19 ports in Asia including seven Chinese and five Japanese ports with direct calls as well as 21 ports in the US and Canada, seven North European and 17 Mediterranean ports, seven ports in the Middle East and Red Sea, three Indian Sub-Continent ports, and seven ports in Central America/Caribbean. The network entails eight services in the Asia/Europe trade including three services covering the Mediterranean market; 16 joint services operated by THE Alliance members on the Trans Pacific trade; seven loops in the North Atlantic trade covering North European, Mediterranean, US, Canada and Mexico ports; and two loops in Middle East. According to ocean shipping schedule and capacity database BlueWater Reporting, THE Alliance currently operates 32 services in similar tradelanes, with 239 total vessels deployed. The member carriers also reiterated that, as of April 1, 2018, the three Japanese members of THE Alliance – MOL, NYK, and “K” Line – will combine their container operations into a single entity called Ocean Network Express (ONE). ONE will continue to be a core member of the streamlined THE Alliance partnership along with Hapag-Lloyd and Yang Ming, the carriers said. Containerized cargo volumes at the largest port on the U.S. East Coast increased 9.2 percent to 588,848 TEUs for the volumes, according to the port authority. The Port of NY/NJ recorded strong volumes for October 2017. The Port of New York and New Jersey handled 588,848 TEUs of containerized cargo in October 2017, an increase of 9.2 percent compared with the same month last year, the port said Monday. The port handled a total of 334,324 containers during the month, an increase of 8.3 percent compared to the 308,605 containers in October 2016. So far this year, total container volumes have grown 7.2 percent to 3.2 million units, up from the 2.9 million during the first 10 months of 2016. In addition to setting a new monthly record, October 2017 also ended up as the fifth best month in the port’s history for cargo volume, helping to continue the positive trend seen throughout 2017. October import loads grew 5.8 percent year-over-year to 305,729 TEUs, while export loads ticked up 1.3 percent to 121,203 TEUs. Year to date in 2017, export loads increased 3.2 percent to 1.1 million TEUs compared with the same 2016 period, and import loads were up 6.4 percent at 2.8 million TEUs. Export empties jumped 24.9 percent for the month and 14.6 percent through October, while import empties declined 16.3 percent for the month and 18.8 percent for the year so far. Rail volumes at the port set a record for the most lifts in any month at 51,206 containers in October. It also marks the third time that rail volume is over 50,000 containers, the port said. For the first ten months of the year, rail moves are up 3.8 percent. Auto volumes were also up 12.4 percent for the month compared to the prior October at 51,135 units, and up 24.4 percent year to date at 515,323 vehicles handled. The Israeli ocean carrier had a net profit of $25.2 million for the quarter compared to a new loss of $37.6 million for the third quarter of 2016, thanks to increasing freight rates, higher volumes and cost utilization, president and CEO Eli Glickman said. ZIM handled 688,000 TEUs during the third quarter of 2017, a 10.6 percent boost from the third quarter of 2016. ZIM recorded a net profit of $25.2 million for the third quarter of 2017, compared to a net loss of $37.6 million for the third quarter of 2016, the Israeli ocean carrier revealed Thursday. ZIM’s profit for the quarter was driven by increasing freight rates, higher volumes, and cost utilization, ZIM President and CEO Eli Glickman told American Shipper. Glickman took the helm as ZIM’s new president and chief executive officer on July 1, 2017, succeeding Rafi Danieli, who had served as president and CEO of ZIM since 2009. Revenues for the third quarter of 2017 climbed 26.8 percent year-over-year to $816.7 million, with container volumes rising 10.6 percent to 688,000 TEUs. Glickman attributed the volumes boost to the Pacific and intra-Asia lines. The average freight rate per TEU totaled $1,058 for the quarter, a sharp increase from $887 for the third quarter of 2016. “ZIM’s encouraging Q3 results are a cause for optimism, and we hope they reflect a momentum that we can keep up in the coming quarters; however, we still face many challenges, including the uncertainty of market conditions, including freight rates and bunker prices,” Glickman said in a press release. 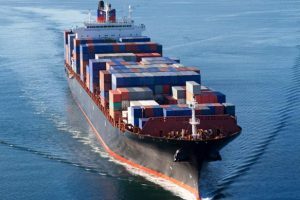 ZIM recently announced the completion of a paperless bills-of-lading pilot based on blockchain technology, which was completed in cooperation with Sparx Logistics and Wave Ltd. “The pioneering pilot, first of its kind led by an ocean carrier, was concluded successfully,” ZIM said. All participants during the trial – which involved the shipment of containers by Sparx Logistics from China to Canada – issued, transferred and received original electronic documents using the Wave Application. Looking ahead, Glickman said he believes ZIM is on the right track as it continues to outperform the industry, and that the company is currently in the process of finalizing its 2018 budget.